When you have painful arthritis that affects your hands and fingers, it becomes very difficult to live your life and do normal day to day activities. There isn’t much we don’t use our hands for and, when you are limited by pain and swelling, it can be frustrating to not be able to participate in your favorite hobbies or sports. Arthritis gloves have become a welcome technological advancement for those that have been suffering from arthritic symptoms. Designed by doctors, therapists, and medical companies, compression gloves for arthritis help to ease pain and swelling and allow you to live your life the way you want, not by what you are limited to. When your hands are affected to the point of being debilitating, it can be difficult to give up all your favorite activities, so it is important to find the right arthritis glove for your symptoms. 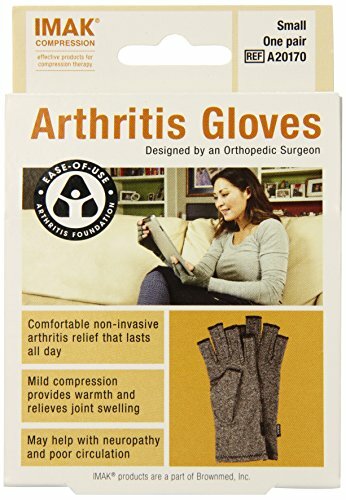 Here are a few tips on what to look for in the best arthritis gloves, and a few reviews to help you start shopping. Arthritis gloves are not a cure or even a treatment; they are a non-invasive alternative that targets pressure points to relieve swelling, stiffness, and pain. Compression gloves work to improve your circulation and blood flow while providing warmth and lessening swelling. The gloves come in different firmness levels that range from light to fitted compression. Arthritis gloves can either cover your hands completely or reach to the beginning of your fingers. Some of the more popular gloves are either fingerless or stop right at the second bend in your finger. Most manufacturers have directions for sizing while others offer standard small, medium, and large sizes. If you are looking for a clinically proven heat therapy to help you with your pain, the Thermoskin Premium Arthritis Gloves uses a combination of gentle support with heat therapy to bring natural relief to your arthritic symptoms. The Thermoskin Premium Arthritis Gloves are anatomically shaped with a special design that relieves arthritic pain in your hand and fingers. Clinically proven to improve blood flow and skin temperature, the Thermoskin Gloves give you light compression and support. The Thermoskin Gloves are able to capture your own body heat to help relieve your pain. If you are suffering from swelling and sore joint pain, the Thermoskin Gloves lessen the chances of these symptoms, and they are even helpful when you are gardening and doing household chores. Thermoskin Arthritis Gloves are not just used to treat arthritis, but are also good compression gloves for edema. These gloves use GripTex on their outer layer to give you additional grip, plus there is a Velcro closure for a better fit and easy use. They not only help arthritis pain sufferers, but anyone that needs gentle heat therapy for the joints in their hands. Designed by an orthopedic surgeon, IMAK Compression Arthritis Gloves helps to lessen pains, aches, and stiffness that are related to arthritis. The IMAK Arthritis Glove has also received the Arthritis Foundation’s Ease of Use Commendation for its unique design. With a mild compression for warm that also helps to improve circulation, the IMAK Arthritis Gloves provides healing and reduces pain. Made of breathable cotton material that lets your skin breath and stay dry, these soft compression gloves are meant to be worn throughout the day and night. Open fingertips let you have total freedom to touch, grip, and feel allowing you to do all you day to day activities without problem. The IMAK Arthritis Gloves are an effective and non-invasive relief for arthritis pain that provides a mild compression to lessen and control joint swelling. Imak Arthritis Gloves are comfortable enough to use all night and day to help relieve hand pain, swelling, and arthritis. While providing mild compression to improve blood circulation, Imak Arthritis Gloves are made of a Lycra and breathable cotton that is latex-free and allows your skin to breathe. Open fingertips allow you to feel, grip, and touch while doing daily activities while helping to relieve your arthritis stiffness and pain. Made of a Neoprene material, the Therall Arthritis Gloves offer light compression that lessens pain and swelling with therapeutic warmth. Using your own body’s natural heat, the Therall Arthritis Glove give you long-lasting pain relief and soothing warmth for aching fingers, wrists, and hands. Your skin stays dry with the soft lining that wicks moisture away, and it is the perfect glove if you have arthritis, repetitive use injuries, tendonitis, or Carpal Tunnel Syndrome. CopperJoint Arthritis Gloves include gentle compression from their infused copper arthritis gloves that help alleviate the symptoms of RSI, arthritis, tendonitis, muscle fatigue, and carpal tunnel. These soft gloves are meant to be worn both day and night, and they can be used when doing day to day activities. The CopperJoint Arthritis Gloves improve circulation and blood flow with mild compression. They also give you additional warmth and increase blood movement in your hands which helps to remove stress and stimulate your joints. The open fingertips allow you the flexibility to do household chores as well as write and type with ease. 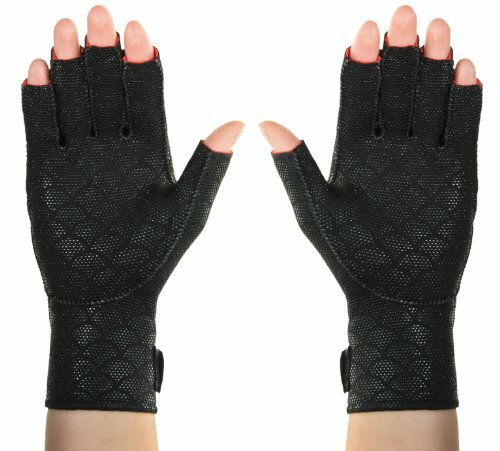 You no longer have to worry about simple activities like opening jars or using a computer mouse since the rubber grips and traction on the gloves help you to do all these tasks with ease. The top quality Nylon has active Copper that is very efficient in getting rid of odors. It is made of a high performance, breathable fabric that keeps your joints at an optimal temperature. The anti-Itch UPF 50+ material is ergonomically designed to give you a full range of motion as well as superb comfort and mobility without irritation and chafing. While minimizing injury, the CopperJoint Arthritis Glove offers the most muscle support during normal day to day activities, and they can be worn under thick gloves in the winter time. Appearance: Most arthritis gloves come in either black, tan, or gray, so you won’t find a lot of variety in colors. Depending on the brand, they also may have either a smooth look, a cotton appearance, or they may look similar to a bike glove. Latex Free: Some of these gloves to contain latex, so, if you have a latex allergy, make sure to check and see if that brand has a latex-free alternative. 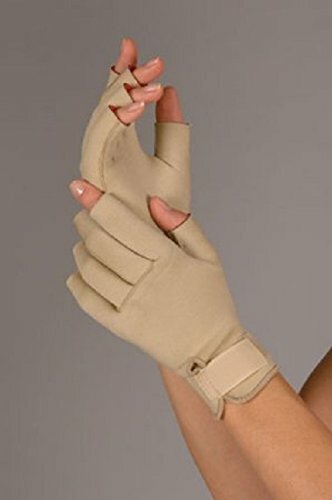 Anti-Itch: Depending on the manufacturer, some arthritis gloves are made with an anti-itch material. If you have a problem with gloves feeling scratchy, look for brands that feature an anti-itch material. Moisture-Free: It is pretty common to find gloves that have used material that is designed to increase air flow, so your hands stay dry and not sweaty. Copper Infused: There is a theory among some specialists that copper has pain and swelling relief properties. Some manufacturers are using this theory and infusing gloves with copper to maximize on these benefits. Glove Length: As discussed above, the gloves offered today vary from open fingertips to completely covered hands and fingers. 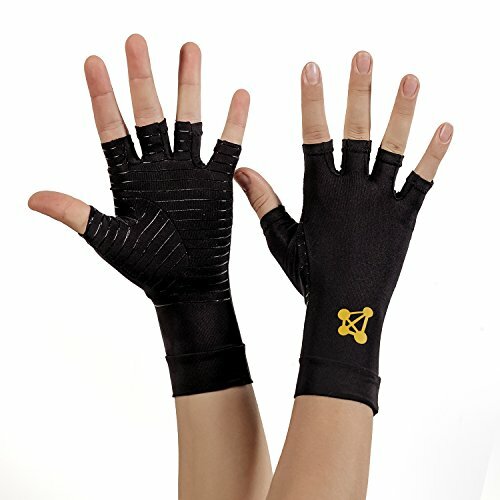 Material: The most common types of material that are used in arthritis gloves include spandex, cotton, spandex, and nylon. Stitching: As these are compression gloves, it is possible for the stitching seams to be uncomfortable if they are not placed correctly. It is always a good idea to check reviews and see if this is an issue with the gloves you are considering. Anti-Slip: If you are using your gloves while you are doing normal day to day activities, it is important to be able to grab items without them slipping between your fingers. Look for arthritis gloves that have the anti-slip feature, so that they are easy to use with the most common activities. Compression gloves for arthritis are a wonderful way to relieve pain and swelling associated with arthritis. When painful arthritis is affecting your day to day life, you want to make sure you find the best arthritis gloves that will help the symptoms you have, so you can still play sports and participate in your favorite hobbies. Nothing is worse than debilitating pain in your hands which can affect every aspect of your life. With the creation of arthritis gloves, those afflicted with the pain associated with arthritis have more non-invasive options to use, so they can get back to living their lives the way that they want.